kissing the frog: What's up this week on kissing the frog? What's up this week on kissing the frog? First off, I want to welcome any new followers. I’m so grateful that you’re taking the time to come to my corner of the blogosphere. Have you read Joey’s story yet? I think that might explain a lot about where I’m coming from most days. Something came up this week – something AWESOME – so I’m taking some time off. Don’t worry, though, I have some great stuff lined up for you while I’m gone. On Tuesday, I have a lovely guest post from a new blogger, MommyRiverBadger, called My Mom and Me. And the T.V. You will love her sweet, thoughtful voice. On Wednesday, I’m divulging my family’s favorite gluten free chicken noodle soup recipe over at Her View From Home. It’s simple, it’s delicious – you have to try it. On Thursday, I have another wonderful guest post from The Mom of The Year called In with The Cool Crowd. I think everyone will be able to relate to what she’s saying. On Friday, my mom visits again with some timeless advice and observations on life. You won’t want to miss it. In the meantime, check out my latest piece on Huffington Post Parents, called The Last Four Years. It hit me, while watching President Obama’s second Inaugural celebration, how quickly time can fly. And how the last time President Obama took the oath of office, a very healthy, very vibrant Joey sat by my side. I’ll see you next Monday with another list. I’m thinking maybe something about toddlers again or about a certain square cartoon character that moms loathe, but children love. Stay tuned to see which I pick. Oh, by the way, did you know that I’m on Pinterest? I’m involved in several group boards, so check me out at pinterest.com/kissingthefrog, and maybe you will find lots of new and interesting bloggers to follow. I’ve been reading two books by two bloggers I really admire. One is Spending the Holidays with People I Want to Punch in The Throat by Jen of People I Want to Punch in the Throat (don't let the name fool you). I know it’s after the holidays, but I am still laughing hysterically as she takes a walk down Memory Lane of Christmases past. The other e-book I am reading is Part of My World by the dual talented Kim of Let Me Start by Saying. In her first book, she changes gears from her quick wit and hilarious observations to show off her fiction writing talent. She showcases several of her short stories, and each one is more lovely and riveting than the next. You can find both these books on Amazon. And speaking of e-books, did I tell you I am in one?! When Anna of My Life and Kids asked me to participate in a collaborative effort with other bloggers and the b Positive Project, I jumped at the chance. The result is Be Positive, an often hilarious and always genuine look at how 19 bloggers stay positive, stay inspired, and most importantly, stay funny! The book is free, and you can access it here. 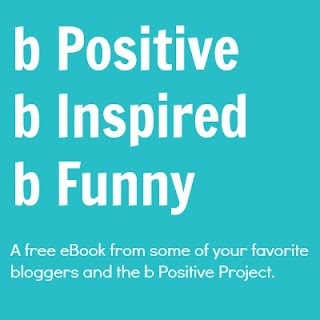 The b Positive Project is a t-shirt and apparel company that creates comfy clothes and tries to inspire people to have a positive mindset and do good things for others. From wrinkles, to depression – from parenting with humor to inspiring our husbands *wink* – this eBook might make you think. It might make you cry. It will definitely make you laugh out loud. And for every purchase you make from the b Positive store using the special 10% off code in the book, a child with cancer gets a free t-shirt. This project is so close to my heart. Not only have I had a child with cancer, but I've struggled my whole life to be positive. I hope you will check out this wonderful book! Aaaannnnd, it's a new month, so will you please click the Best Mom Blogs button to left for me?Thanks!! Thanks for sticking around! I’ll see you next week! !